Spring 1 2018 Session Sign Up! Monday, January 29th – Current students that are staying the same day, time, and level. Monday, February 5th – Current students that are wanting to switch days, times, or levels. Monday, February 12th – Open enrollment for all current and non-current students. *Registration is run on a first-come, first-serve basis. 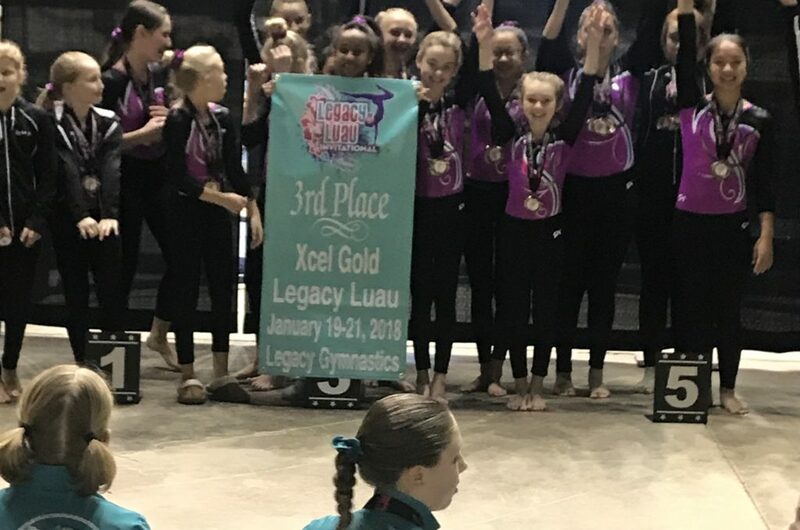 Legacy Luau was the forth meet of 2017-2018 Xcel meet season. The silver team took home a fourth place win. 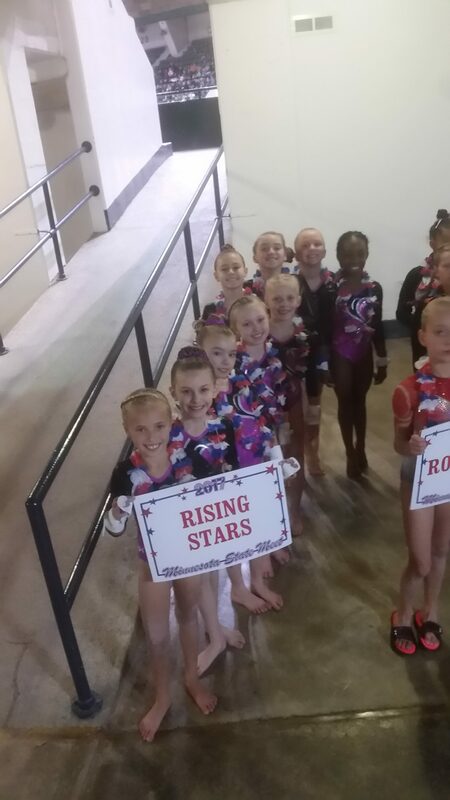 Leading the team was Stella J., Ella K., Alexandra W., and Savannah B.. All of the 28 silvers at Rising Stars have qualified themselves for the state meet that will take place in March. Awesome job gymnasts! The Xcel Gold team placed third, only missing first place by one point. Katie B and Katie S. were our top competitors for the meet. 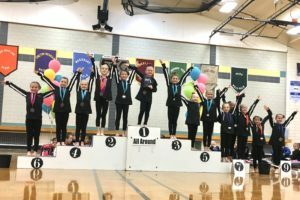 The Gold gymnasts also had five more girls qualify for the state meet in March. Only four more to go! Great job ladies! The Xcel Platinum team had a great meet as well, coming home with a third place win. Platinum also missed placing first by one point. The team was led by Lacey T, and Luka J. All of our platinum gymnasts are also qualified for there state meet in March. Amazing job ladies, keep up the great work! 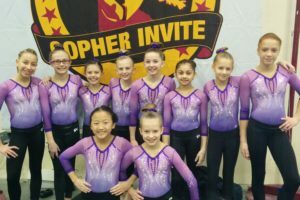 Congratulations to our competitive team levels 9/10 that competed on Sunday, January 7th having their first meet this season as they attended the Gopher Invite. 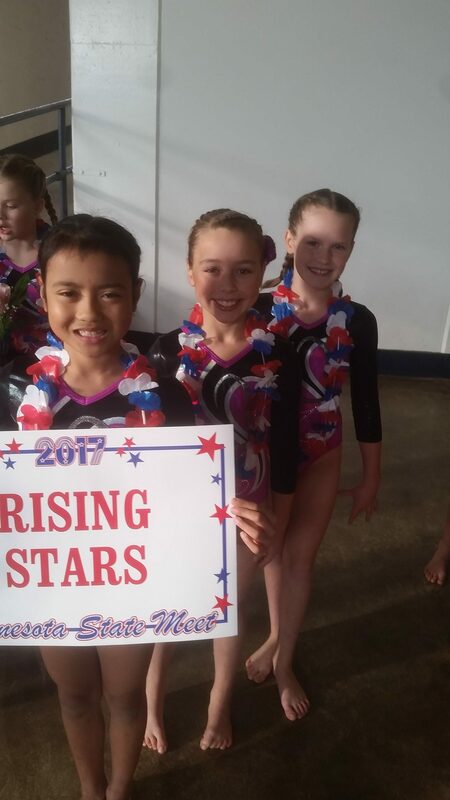 We are proud of our Rising Stars gymnasts who worked hard and did very well! 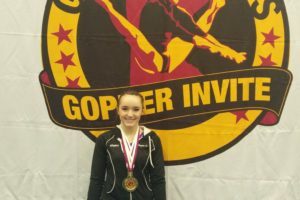 Congratulations to our level 9 gymnast Taylor S. (pictured below) who placed 1st and had an outstanding score of 9.625 on Vault. Taylor also placed 1st on Floor and AA with a score of 35.625! Congratulations to level 10 gymnast Mya H. for also placing 1st on Vault with a big score of 9.625! She also placed 3rd on bars and AA. Mya surprised judges with a powerful full in on floor and placed 4th! Lindsey M. placed 3rd on beam and Bella F. placed 4th on floor, bars & AA! 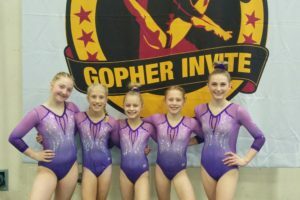 Congratulations to our competitive team girls levels 6-10 that competed this past weekend at the Gopher Invite! All teams placed very well and had so much fun in their first meet of the 2018 season! We look forward to a great meet season with all of our competitive gymnasts! Level 6 placed 4th overall. Level 7 placed 1st overall. Level 8 placed 2nd overall. Level 10 placed 3rd overall (Not Pictured). 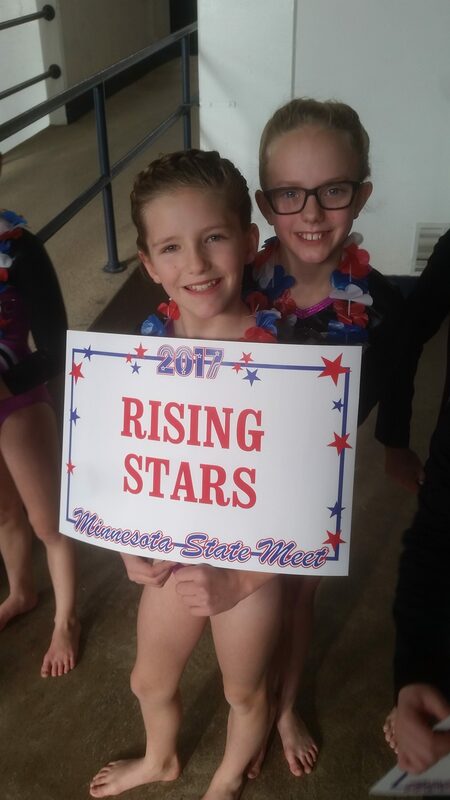 Rising Stars Gymnastics Academy Level 3 and Level 4 teams recently wrapped up the 2017 season with a fun showing at the MN State Meet. We are immensely proud that all 30 athletes were able to qualify this year. Each and every girl represented RSGA with confidence and sportsmanship. We had nine top 10 finishes for level 4s within six different age categories. Keiona R tumbled big for 8th place on floor (9.05). Ayana C-K was able to hit a strong beam routine which helped her take home 5th place on beam (9.225) and 10th place in the All-Around competition (36.25). Stella G showed her power on vault (8.775) and bars (9.2) receiving an 8th and 6th place finish. This paved the way for a 7th place medal in the All-Around (35.825). Geneva R showed off her dance for a 3rd place and 8th place finish on the beam (9.25) and floor (9.15). Geneva was also able to claim 5th place in the AA at state (36.25)! 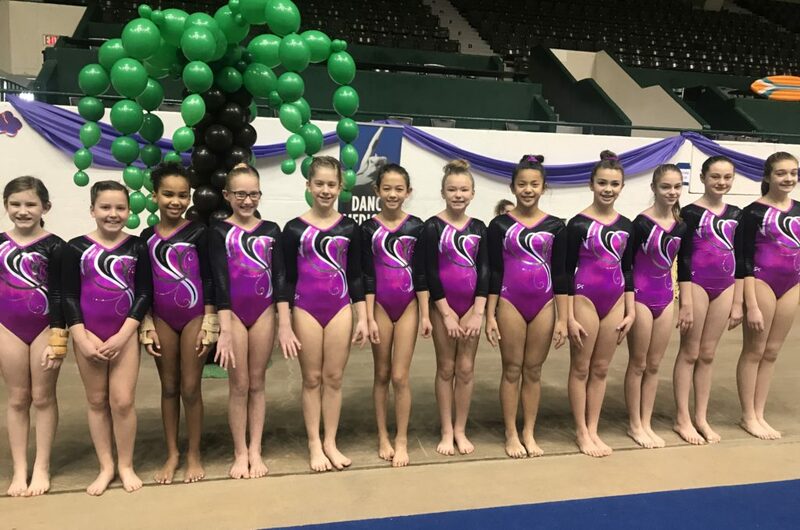 The level 3’s were placed among 94 other girls who competed during the same session. Although they were not recognized for individual events at the competition, Addison K and Avery D were able to rank 6th and 8th on the uneven bars with big scores of 9.55 and 9.525. 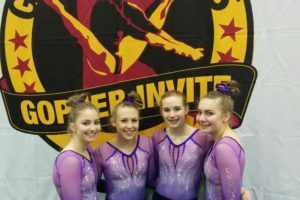 Congratulations to all of our compulsory gymnasts for qualifying to the MN state meet! Makayla B. Ayana C-K. Adriana F. Stella G. Madeline H. Breanna J. Isabelle K. Sophia M. Clara O. Laiken P. Geneva R. Keiona R. Madelyn S. Madison S. Hannah W. Abby W.
Ellie C. Avery D. Violet G. Kaylee F. Piper F. Addison K. Nellie L. August L. Eraya N. Ava P. Ariah R. Brynna S. Kaleigh S. KaciU. We look forward to learning new skills and training hard for another season! CandyLand Challenge was the third meet of our 2017-18 Xcel season! The silver team took home a second place win, with Amanda M., Alexandra W., and Regan J. leading the team. 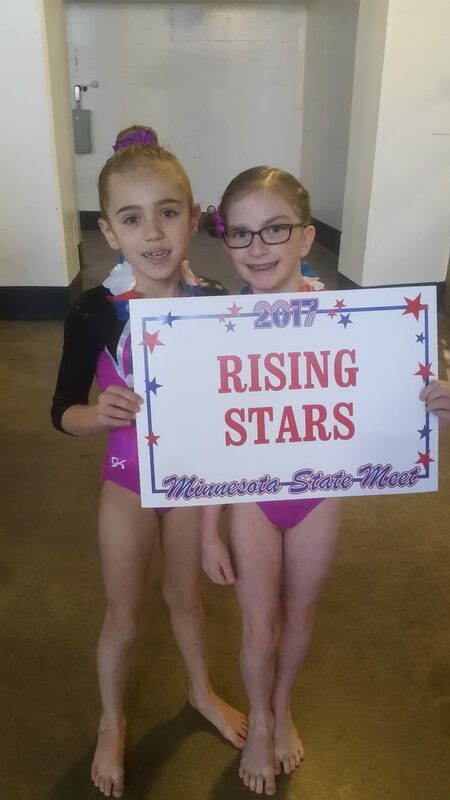 All 28 of our silver gymnasts at Rising Stars have qualified themselves for the state meet that will take place in March. Awesome job Silvers! The Xcel Gold team placed first and remains undefeated for the season. The Gold team was led by Sofia L, and Kylee J. Great job ladies, keep up the good work! 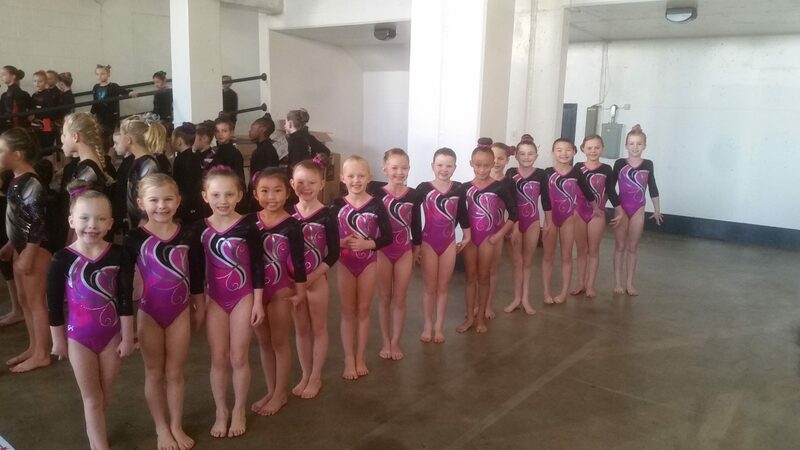 The Xcel Platinum team had a great meet as well, coming home with a third place win. The team was led by Luka J. and Lacey T. Great job to all of our gymnasts! We hope everyone had a good holiday break! We are currently in our Winter Session which runs until February 24th. Students that had class on Monday, New Years Day, will receive an extra makeup. 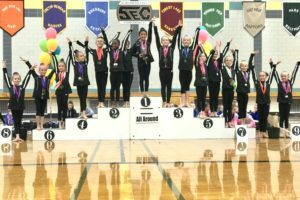 Glitz and Glam was the second meet of the Xcel 2017-18 meet season! Our gymnasts are off to a wonderful start! The silver team took home a second place win, with Katie H. and Chloe E. leading the team to their second place finish. Way to go, Silver team! 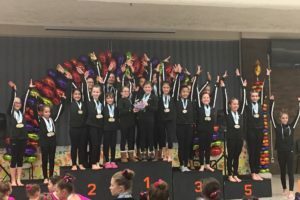 The Xcel Gold team finished with a first place win, and was led by Sofia L., and Lila H. Bella G. also had a personal best on beam with a 9.0. Great job, Gold team! The Xcel Platinum team had a great meet as well, also coming home with a first place win. The team was led by Luka J. and Elise K. Keep it up, Platinum team! Great job to all of our gymnasts that competed! 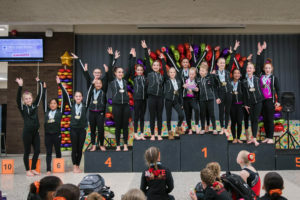 The level 3 and 4 teams completed their fourth meet of the season on Saturday, Nov. 4. The Royal Rose Invite looked to be just another day in the office for both teams. The level 3s finished in first with a 108.725 and the level 4s placed second with a score of 108.925. There were many top finishes for the level 3s. Kaci U. was awarded first place with a 36.00 and Violet G. was closely behind her in second place with a 35.875. Addison K. and Piper F. followed in fourth and fifth places with scores of 35.325 (Addison K.) and 35.225 (Piper F). On Vault the top place was awarded to Avery D. who scored an outstanding 9.525. She was followed closely by Kaci U. in second and Kaylee F. with scores of 9.425 and 9.375. Brynna S. was awarded fifth place with a score of 9.350. The girls finished in the top four on bars with Piper F. taking first with a solid score of 9.375. Kaci U., Addison K., Ellie C. and Violet G. placed second, third and fourth with a tie with scores of 9.250, 9.225 and 9.1. Although the competition was stiff on beam the 3s top all of the top five places. Kaci U. took first place with an 8.625. Addison K., Kaylee F., Violet G. and Brynna S. followed closely behind Kaci U. in second, third, fourth and fifth places. Violet G. earned herself a first- place finish with a 9.3. Ellie C. finished floor in third with an 8.950 and Ava P. followed suite in fourth with a score of 8.875. 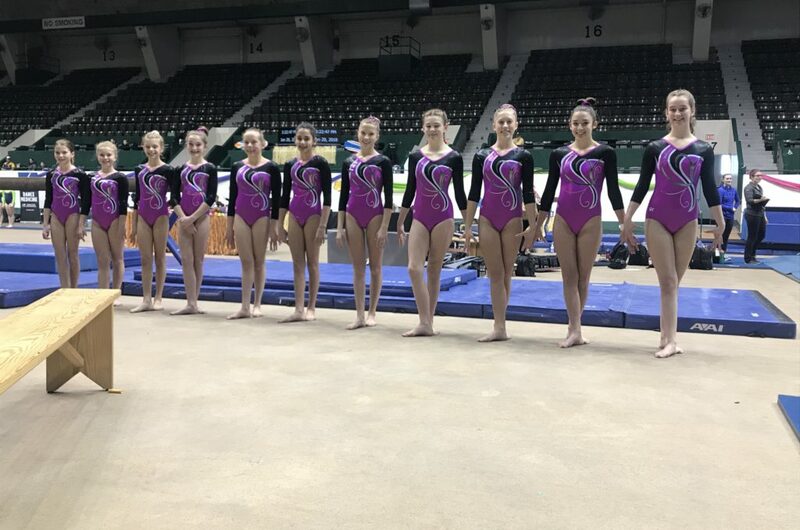 The level 4s had good performances with Geneva R. finishing third in the All- Around with a 36.150 in the 10- year-old age group. In the 9- year- old age group Stella G. took second with a 35. 725. In addition to the top five Sophia M. and Keiona R. finished fourth and fifth with scores of 34.950 and 34.775. 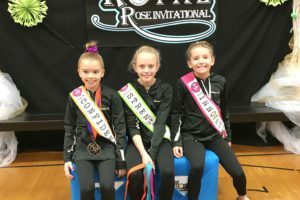 In the 7-8- year-old age group Laiken P. and Madelyn S. received second and fifth place finishes. On Vault Geneva R. finished fifth in her age division with an 8.750. Sophia M. and Stella finished in second and fourth with scores of 8.7 and 8.5. In the youngest age group Madelyn S. finished fifth with a n 8.250. On Bars, in the 10-year- old age group Madeline finished in the top five with a 9.325 earning herself a fourth- place finish. In the 9-year-old group Sophia took the top place with a 9.3. Stella finished closely behind her in second with a 9.250 and Keiona R. took fourth with a 9.050. Laiken P. finished third with an 8.375 in her age group. Geneva R. finished in third on Beam with an 8.975 with Ayana C. following closely in fifth with an 8.875. Stella G. finished in second with an 8.875. Hannah W. and Makayla B. finished in fourth and fifth with scores of 8.750 and 8.5. Laiken P. and Madelyn S. finished in the top five in their age group. Ayana C. finished in the top two with a 9.4 and Geneva R. placed third with a score of 9.375. Hannah W. took first with a score of 9.275 in her age division. Sophia M. (9.150), Stella G. (9.0) and Keiona R. (9.0) also finished in the top five in the 9-year-old division. Laiken P. finished in fifth place with a score of 8.550, in her age division. Congratulations to those who competed and best of luck as you all as you prepare for the Cotton Candy Invitational, Saturday, Nov. 18! We are proud of all the hard work!